Round 2 of the 2009 Tribute series was hosted by Mevagissey Gig Club at Pentewan Sands. Results : Mens – A 9th, B 12th. Ladies – A DSQ, B 13th, C 2nd. U16 7th. Vets 14th & 20th. Another great day out for the club, I managed to tow Pinnacle there and back without any problems. Big thanks to my trusty wing men Jowan and Neil (or no thanks if you ordered some kindling). All the race crews rowed very well, each week we are creeping up the results table. 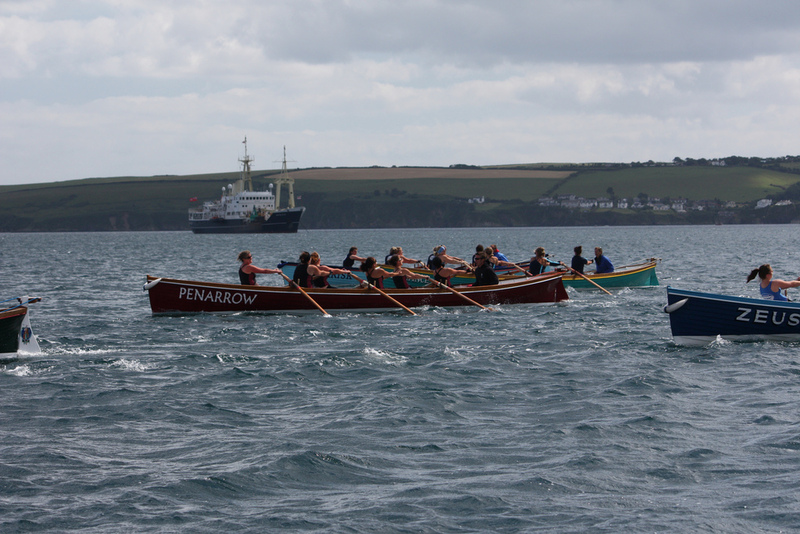 The only sad point of yesterdays racing was that after our Ladies A fantastic first leg, Paignton’s boat Top Catch decided to cut them up on the mark. 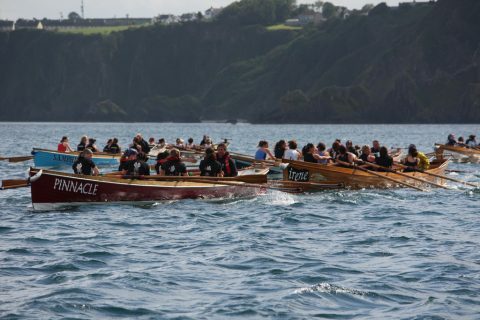 Unfortunately for our girls, Top Catch had water on the mark, but in a moment of, er, genius Neil the cox managed to relieve the very tired Paignton rowers on stoke side of their oars so our girls were disqualified. Jeremy had a very important job, he was one of the official starters for the afternoon. Afterwards he said he had thoroughly enjoyed it because he had managed to dry four pillow cases, a vallance bed sheet and a throw over for a sofa – thought that flag looked strange. Anyway Helford next Sunday, let’s see if we can win some silverware and l don’t mean on the tombola. Cheers, Blako. Pic : FMPGC Ladies C lead the fleet with their ultimate nemesis Newquay crew in “Hope” behind. Just one second separated them at the finish! Pic : Ladies A in Penarrow, just before 1st mark.